And now, the moment we (all?) 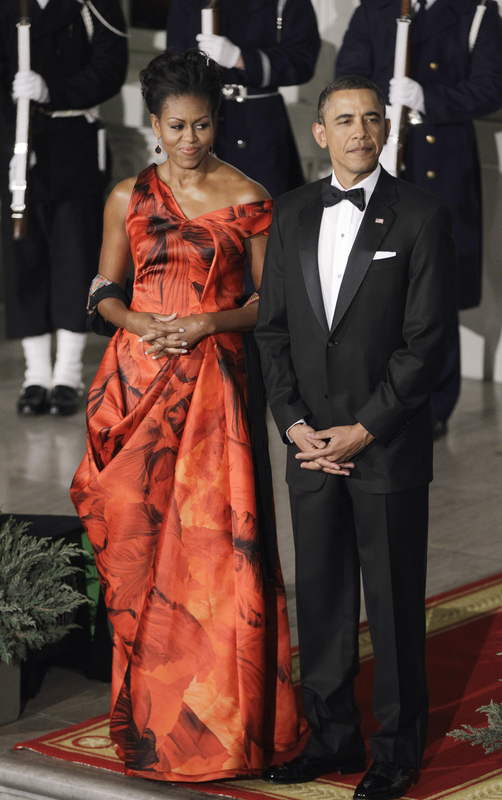 have been waiting for: Michelle Obama's latest state dinner dress! In keeping with today's theme it's red, which symbolizes good luck in Chinese culture. The dress is by designer Alexander McQueen, who died almost exactly one year ago. Her earrings were by Kimberly McDonald. Scroll down for more photos or see photos of all the arrivals here. Not to toot our horn, but we spotted this red trend earlier today: Mrs. Obama wore red gloves, President Obama wore a red tie, and Sasha wore red pants for President Hu's arrival, and Hillary Clinton wore a red jacket to lunch. Visit the State Dinner big news page.